Peter Murphy (born July 11, 1957) is the singer of the seminal Goth-rock band Bauhaus. He also appeared in early UK Maxell cassette ads and has recorded with Mick Karn of Japan under the name Dali's Car. After the breakup of Bauhaus, he pursued a solo career, which has remained a constant project despite two reunion tours. As a solo artist, Peter has expanded on the doom and gloom theatrics of Bauhaus and has explored a variety of different styles. His solo career remains more commercially successful than his previous band, with his 1990 record Deep spawning hit single "Cuts You Up". Peter has often incorporated more tribal rhythms, pop sensibilities, and Middle-Eastern instrumentation throughout his solo career. Nine Inch Nails was the opening act for Peter Murphy's Deep Tour in 1990. In 2006, Peter performed with Trent Reznor and a rotating panel of guests for a series of special radio appearances which took place during the With Teeth: Summer Amphitheater Tour. 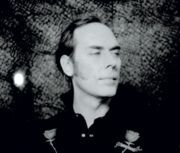 Several Bauhaus and Peter Murphy songs were performed during these sessions. Peter Murphy has been a surprise guest during the last leg of the Wave Goodbye Tour many times. The following is Murphy's solo discography. Please see the Bauhaus page for their respective discography. This page was last modified on 18 September 2017, at 03:12. This page has been accessed 32,571 times.